Hello Sassy friends! Welcome to the month of August and a brand-new challenge. We're at our 75th challenge already. Time sure flies by. Hopefully it's not blazin' hot in your neck of the woods and you are staying cool, or at least staying indoors and crafting! number 7 and that is Barbara! Congrats to you, Barbara. 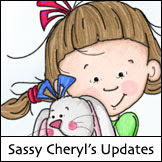 Have a great time picking out some new digis at Sassy Cheryl's digi shop. If you would please email Sassy Cheryl so she can arrange for your gift certificate, then you will be all set. Happy shopping! 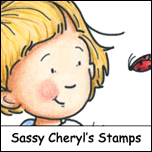 Before we get to the challenge details, here's a bit of very happy news from Cheryl and the Sassy team. We are so lucky that the very talented Pat Frank has joined us. Please meet Pat and give her a sassy welcome! I'm 50-something (more "something" than 50!) and married to my best friend who totally "gets" this crafting obsession of mine! I am so blessed to have him as my biggest fan and supporter...(and enabler"...but I prefer "supporter"! ) I am proud to be "Gramma Pat" to five incredible grandkiddos...ranging in age from almost 13 down to almost 5...4 girls and one boy! Talk about being blessed, huh? My three children and our 5 grandbabies live in Phoenix, AZ...while my hubby and I live 2000 miles to the east in Richmond, VA. Fortunately, I travel to Phoenix regularly to get my "grandbaby fix"!! I am getting ready to retire after almost 30 years of a fantastic career as a Registered Nurse, Neonatal Nurse and Educator. Now, I look forward to days of being a SAHC (stay at home crafter), homemaker, and travelin' gramma. 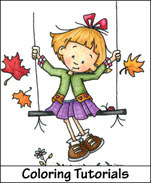 I've always been pretty "crafty"...but started seriously getting into coloring and cardmaking late in 2009! I traveled to Northern Virginia in the fall of 2009 to take a Copics coloring class, debuted my blog in March, 2010...I discovered digis...and the rest, as they say, is history!! Thank you so much for this incredible opportunity to join Sassy Cheryl's DT! And, from all of us on the team, a very special welcome, Pat! We are so glad to have you with us. We'll have you 'sassy' in no time (but I think you already are)! Miz Sassy Jeni set the theme for this week's challenge and she's looking for some type of card fold other than the standard type of fold. Here's what Jeni and the Sassy gals have created. Lots of great ideas for different folds. You can find out more details for the folds the Sassy gals used at each of their blogs. So, what will you create for our special fold challenge? To join us, and for a chance to win a $5 gift certificate to Sassy Cheryl's shop (randomly-selected, of course), just link up your design below. We look forward to seeing your creation. Have a fantastic week, Sassy friends! Pat. . . .welcome, welcome, welcome!!!! So thrilled to have you and your AMAZING cards to add to my oh, so talented DTeam!!!! The cards are over the top stunning girls!!! This is going to be FUN! Welcome Pat and like you my kids and grandkids live across the country in Phoenix, too. Girls, I have to tell you I believe this is the single most impressive set of projects I've EVER seen. They are just gorgeous. Thanks for all of the great comments, friends! Welcome Pat. 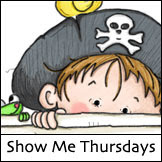 This is a fun challenge blog with some fabulous digis to work with. I look forward to seeing all your goodies each week. Congrats on the win, Barbara! Welcome Pat! Your work is great and I've gotten such wonderful inspiration from you. I look forward to your Sassy Cheryl creations. Fun challenge, Jeni! All of the different and creative folds are great inspiration. Thanks to everyone who played along this week. Hope to see you again next week. Good luck in the drawing! Challenge #76 - What's Buggin' You?